I have been writing books nearly continuously for the last six years. In that time, I’ve had seven books published, with three more due out this year. Most of these books have been shorter works, but, considering I’m only a part-time writer with a full-time job, it has been a major time commitment. Now, I’m nearing a break. My last, major commissioned project is nearing completion. I have a couple of other projects on the go, but they are comparatively small. The truth is, I’m worn out. My writing pace is incompatible with other life events, most notably the care of my young daughter. With the end of my current projects in sight, it is a good time to take stock and reassess. I need some time to refill the creative well which is running a bit low. Certainly, the amount I have called upon it has outstripped the time I have spent filling it. For me, there are two ways to restock creativity. The first is through reading. Reading is by far the best way to collect ideas, and ideas breed and multiply. Absorb a few from other writers and pretty soon you’ll be overflowing with new ideas of your own. The other method is travel, seeing new stuff. This doesn’t have to be long trips to strange foreign lands (although those are great), this can really be as little as going to a new neighbourhood, or the valley just over the hill, or even going to a new museum. It doesn’t hurt that I live in a country that is covered in history. So, going forward, I intend to spend less time and less mental energy on writing and more time reading and seeing new things. I especially want to devote some time to revisiting a few of the authors who originally made me want to be a writer. This doesn't means that I’m going to quit writing. I don’t think I could even if I wanted to. I just want to free myself from long term commitments and work on more short pieces. Most importantly, I want to return to writing fantasy short stories, from which I derive the greatest satisfaction. Heck, I might even manage to write a few more blogs. Also, I want to spend more time enjoying my works. This is most true for my forthcoming wargame, Frostgrave. I want to be free to participate in the excitement the game will hopefully generate in the gaming community. I love military science fiction, but the truth is, you could probably read all of the really good examples of the genre in a year or so, and exhaust all of the movies in an explosion-filled long weekend. So, to keep experiencing the genre, I am forced to look to lesser works, in the dwindling hope of finding a lost treasure. Here are two examples of lesser works that I have recently experienced. 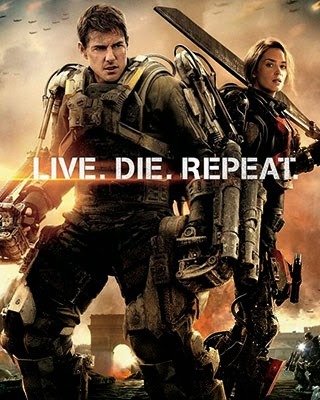 This Tom Cruise movie did so bad at theatres, that when they released it on DVD they changed the title from Edge of Tomorrow to the original tag line, Live. Die. Repeat. Secretly, I was hoping that the lack of success of this movie was mainly a reaction of the last Tom Cruise sci-fi ‘blockbuster’, Oblivion, which was truly a piece of space poo. Well, this movie was better than that one, but not by a lot. The plot is basically Groundhog Day meets alien invaders. While this is amusing and interesting for the first 45 minutes or so, it quickly becomes obvious that the idea works much better in comedy than it does in action. In fact, it is a self-defeating idea. If you can live the same day over and over, changing things until you get them right, then there is no threat. Yes, at some point the repeat cycle is broken, but only after I had quit caring. It’s just as well; the second half of the movie is much worse than the first, becoming such a by-the-numbers Hollywood action movie that I actually groaned a couple of times. Probably the biggest disappoint for me was the infantry battlesuits which gives the movie its distinctive look. These prove to be mostly irrelevant to the story, in fact they are discarded before the end. However, for most of the time they are on screen, they look kind of ridiculous. Only the main characters are actually shown to be combat effective in them, and Tom Cruise only in the later part of the movie. Everyone else looks weighed-down and generally immobile. This is believable enough, obviously they are trying to turn a soldier into a tank, but if this is the case, why are they using them like infantry, in a D-Day-like assault the beaches attack, where the suits are more harm than good? It is now safe to say that Tom Cruise has used up all of the sci-fi goodwill he got from War of the Worlds. In the world of literature, I just finished reading Major by Rick Shelly. 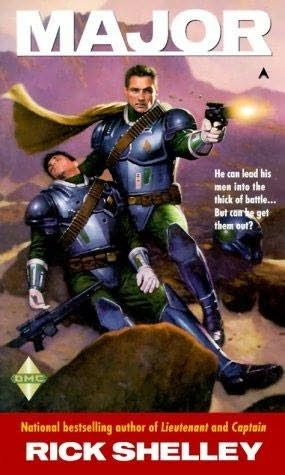 This is book four of a seven book series that follows a mercenary soldier up through the ranks. I have not read the earlier books, but this didn’t make any major difference to the plot. 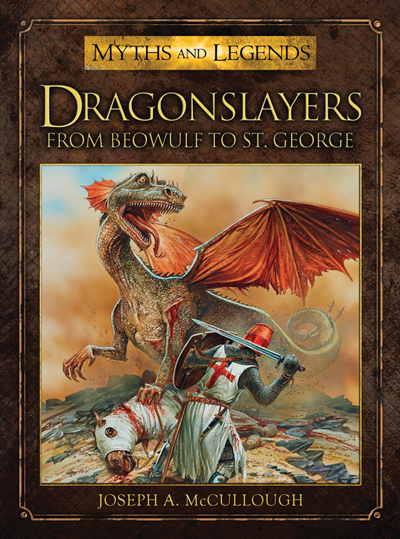 That said, if I had read the earlier books, I wonder if I ever would have made it to this one. Rick Shelly is not a bad wordsmith, in fact, his prose was so smooth and engaging that it kept me reading a lot longer than the plot warranted. The truth is, very little happens in the book. The first four chapters are taken up with the main character sitting on a court martial. It’s interesting enough, but there are no real twists, no surprises, and the whole thing proves irrelevant to the rest of the book. Several chapters of family life and day-to-day routine later, the hero is finally sent out on assignment. A chapter in transport. A chapter meeting the guys who hired him. A chapter looking over the temporary barracks. A chapter meeting the officer in charge of the men he’s hired to train... well you get the idea. By the time there was some action, I’d kind of dozed off. I accept that this book is probably a decently accurate version of what a soldier’s life is really like, but I’m not reading this kind of book to hear about ordinary days!